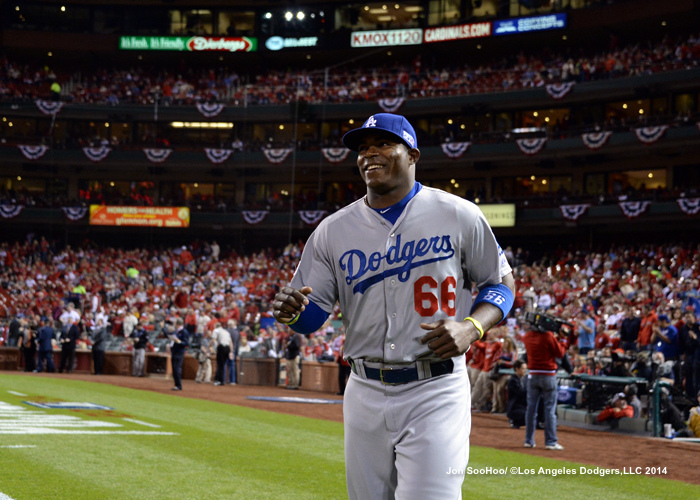 Don’t miss “Think Blue Review,” your weekly video window into the Dodgers’ offseason world. This week’s version, which includes a showcase of the Dodgers’ four Gold Glove finalists, is hot off the online presses, while previous editions can be found at this link. 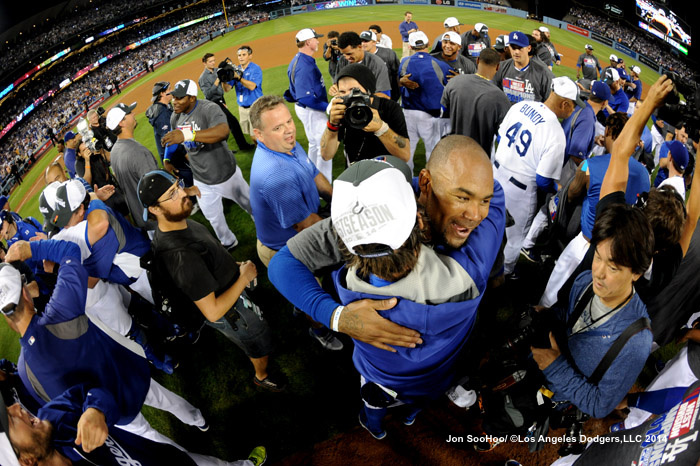 Not that it means anything, but the Dodgers are winners of a kind. Twice a year, in a forward-looking gaze, ESPN.com ranks all 30 Major League teams “in an attempt to measure how well each team is set up for sustained success over the next five years.” In the newest rankings, the Dodgers are No. 1. It’s a nice reflection of the building strength of the organization and a reminder that, despite the disappointment of the past month, that all is not lost. But it’s admittedly an ephemeral honor. After all, when ESPN.com debuted its Future Power Rankings in February 2012, the Dodgers were saddled with the 19th spot, so the site wasn’t exactly effective in predicting how the Dodgers would perform over the next three seasons, let alone five. In fact, even that unimpressive ranking was called “a leap of faith,” despite the promise of an impending ownership change. Right-handed pitcher Dan Haren has exercised his option to play for the Dodgers in 2015. Haren had a 4.02 ERA and 4.09 FIP with the Dodgers in 2014, striking out 145 batters in 186 innings while allowing 222 baserunners. In his final 10 starts of the 2014 season, Haren had a 2.43 ERA with 50 strikeouts in 59 1/3 innings. He turned 34 in September. His best start came June 30 against Cleveland, when he allowed two baserunners in seven shutout innings on the night the Dodgers moved into first place in the National League West after a 9 1/2-game deficit. Now that Madison Bumgarner has gone full Hershiser and then some, now that the San Francisco Giants have a well-earned dynasty of three World Series titles in five years, now that history has recorded this all in fresh ink, I’ve reached the stage of acceptance with the 2014 season. Clayton Kershaw will win the National League Cy Young Award and maybe the MVP, the Dodgers won the NL West, and all anyone will say this winter is how they are inferior to Bumgarner and the Giants. I’m not denying people the right to say it. But if winning the World Series is all that matters, and what you do in the regular season matters not at all if you win the World Series, and if how you finish in the regular season gives no hint about whether you’re going to win the World Series, then why worry about what is happening during the regular season? 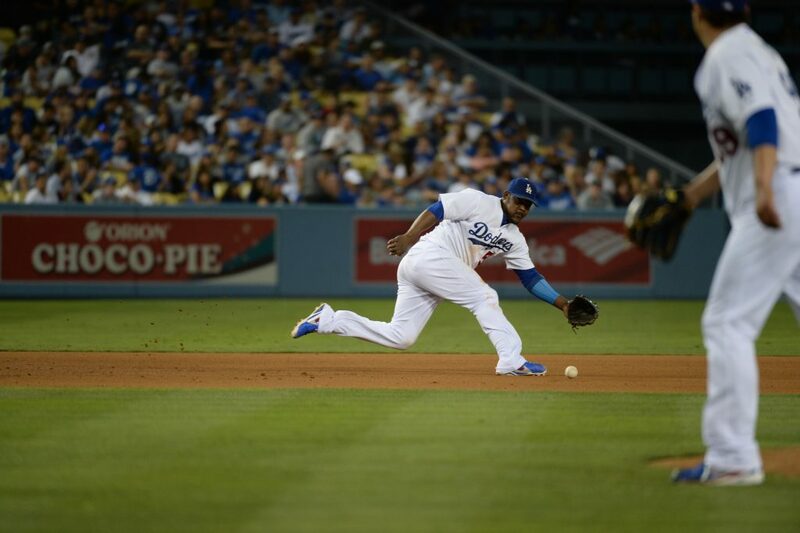 Dodgers set Los Angeles record in BABIP … what happens next year? The Dodgers had a team batting average on balls in play of .318, which was third in the Majors but the franchise’s highest in 84 seasons, since the Brooklyn Robins had a .321 BABIP in 1930. 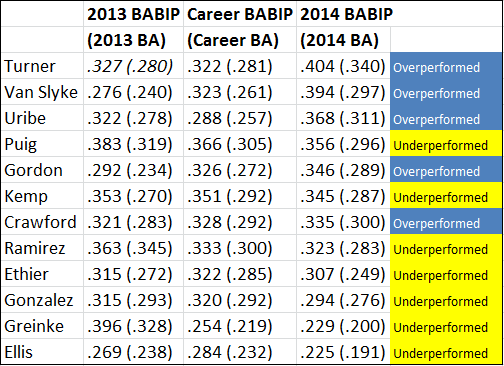 In general, the Dodgers’ BABIP has trended upward in recent years, thanks in part no doubt to strikeouts becoming a larger percentage of outs. It was a different story, for example, in the 1960s, when the Dodgers’ BABIP bottomed out at .266 in 1967 and .268 in 1968. Somewhere right now, someone is driving a car and texting about the horrors of ebola. Dodger prospect Corey Seager has been named to the West Division roster for the Arizona Fall League Fall Stars Game, taking place at 5 p.m. Saturday. Scouting and farm directors from every Major League organization, in consultation with Arizona Fall League director Steve Cobb and his baseball personnel staff, made the selections. The game will air on MLB Network and MLB.com. Playing shortstop, the 20-year-old Seager has a .345 on-base percentage and .412 slugging percentage in 13 games. You might have heard Jimmy Sheckard’s name once or twice this summer, and even so, if you’re a Dodger fan under the age of 120, it was quite possibly the first time you ever heard it. 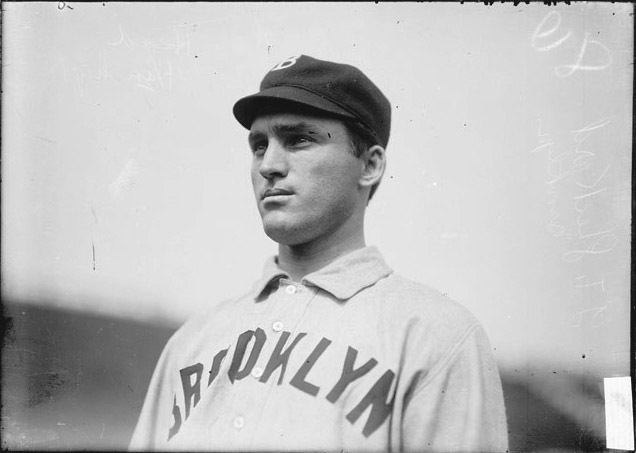 Largely forgotten among Brooklyn stars of the past, Sheckard hit three triples for the Superbas in one game on Opening Day 1901 at age 22, a feat that went unmatched until 23-year-old Yasiel Puig did so against the Giants on July 25. That 1901 season was Sheckard’s best in a career that had more than a few highlights. Sheckard led the National League with 19 triples and a .534 slugging percentage, while finishing second in home runs (11) and total bases (296), third in batting average (.354) and OPS (.944), tied for third in RBI (104), fifth in runs (116), sixth in on-base percentage (.409) and stolen bases (35), seventh in doubles (29). In September, Sheckard also became the only player ever to hit inside-the-park grand slams in consecutive games. This should be the year of the Uribear. Adrian Gonzalez, Zack Greinke, Clayton Kershaw, Juan Uribe and Zack were named finalists for the Rawlings Gold Glove Awards, with winners to be announced November 4. Each position has three finalists. Greinke and Kershaw are up against Adam Wainwright of St. Louis for the NL pitcher Gold Glove. Gonzalez is against Adam LaRoche of Washington and Justin Morneau of Colorado, while Uribe has competition from Nolan Arenado of the Rockies and Pablo Sandoval of San Francisco. 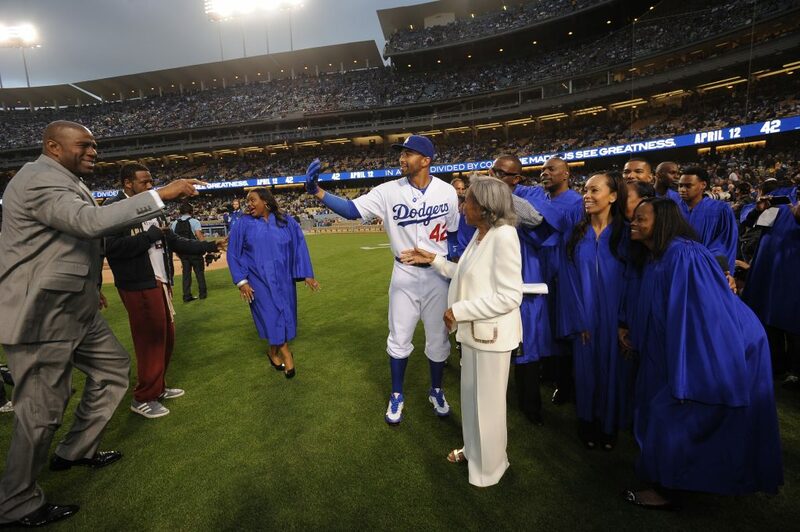 Magic Johnson, Matt Kemp and Rachel Robinson at Dodger Stadium on April 15, 2013. A scheduling quirk put the Dodgers on the road for Jackie Robinson Day earlier this year, but next April 15, Dodger Stadium will be back in the familiar position of hosting the celebration of No. 42. That night, the Dodgers will be taking on the Seattle Mariners, not to mention second baseman Robinson Cano, who was named after the Dodger legend. In addition, Historic Dodgertown at Vero Beach will host the second annual Jackie Robinson Celebration Game, between the Florida State League’s St. Lucie Mets and Brevard County Manatees. Two days after Baseball America named him 2014 Player of the Year, Clayton Kershaw has received the same honor from the Sporting News. 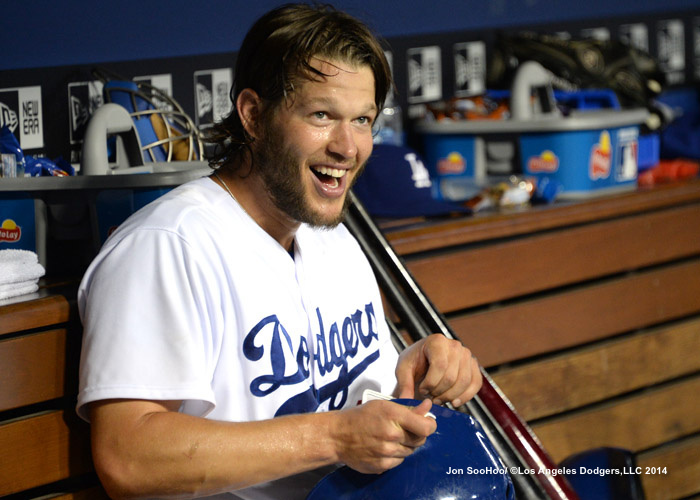 In a close vote from more then 220 MLB players, Kershaw edged out the Angels’ Mike Trout, 76 to 73. Not only did Dodger starting pitcher Clayton Kershaw make the Sporting News’ National League All-Star team, but second baseman Dee Gordon did as well. Gordon topped runners-up Neil Walker of the Pirates, Daniel Murphy of the Mets and Chase Utley of the Phillies in a vote by baseball executives. 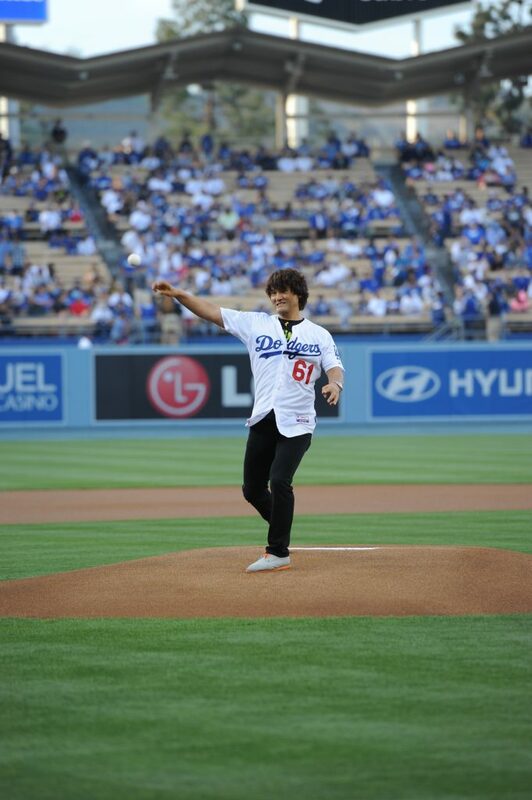 Kershaw was a unanimous choice. 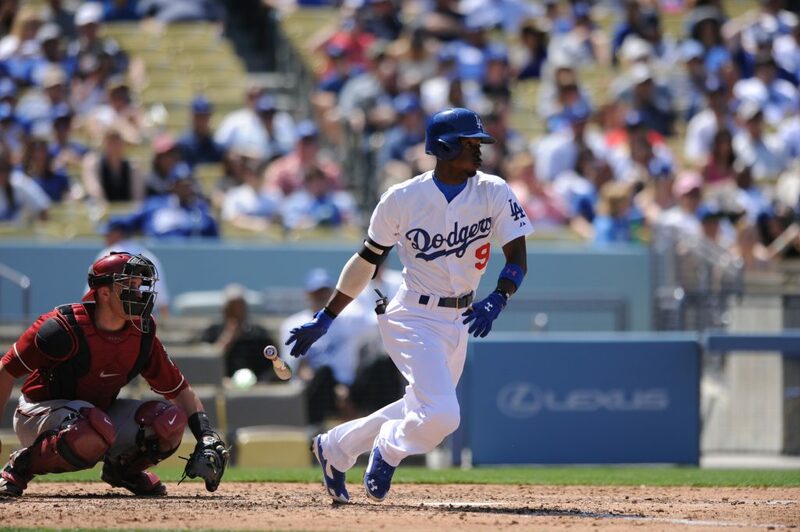 Last year in October, Dee Gordon was on the Dodgers’ postseason roster, but practically in name only. He played in two games, both as a pinch-runner. Gordon was in the playoffs because he was fast — and only because he was fast. This year, Gordon was still fast, but he also became much, much more. But as Gordon will tell you, that development, however ironically, was a long, slow process. Chan Ho Park, Jerry Reuss and Ken Landreaux have joined the team of Dodger legends serving as instructors at the 53rd Los Angeles Dodgers Adult Baseball Camp at Historic Dodgertown in Vero Beach, from November 9-15. 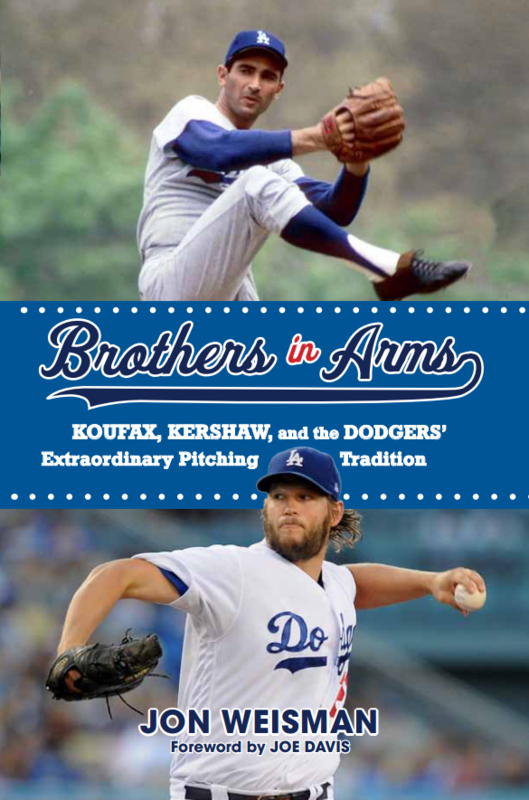 Park, Reuss and Landreaux will join such previously announced instructors as Ron Cey, Tommy Davis, Steve Garvey, Mickey Hatcher, Rick Monday, Maury Wills and Steve Yeager. Tommy Lasorda and former National League umpire Bruce Froemming are also set to be guest instructors. Former Dodger scout Guy Wellman has returned as camp coordinator, a position he has held dating back to 1983. Did Dodgers win the WAR last offseason? For entertainment purposes, I’m about to oversimplify something that’s far more complex than how I’m presenting it. 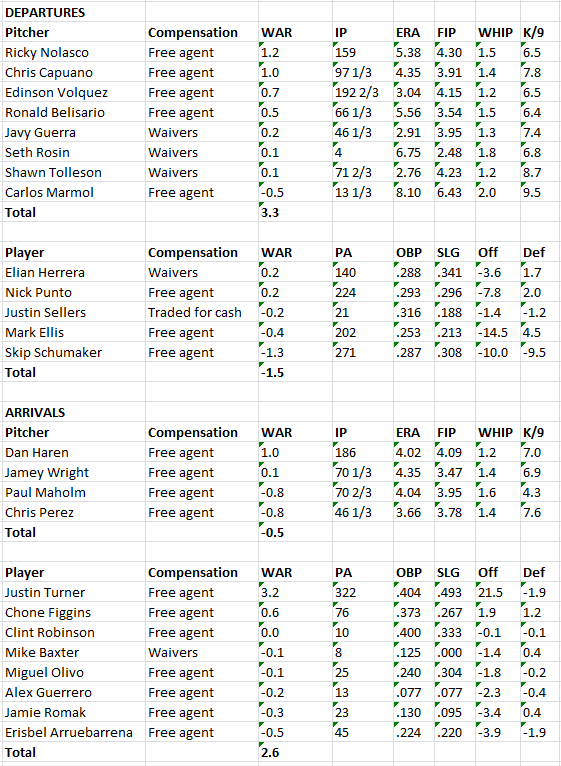 Nevertheless, I was curious what the Dodgers gained and lost in wins above replacement (WAR) from their moves during the 2013-14 offseason. And putting all other considerations aide, the scales almost balanced. The Dodgers received 2.1 WAR from their 2014 additions, according to Fangraphs, while those who left the team after the 2013 season produced 1.8 WAR with their new clubs. 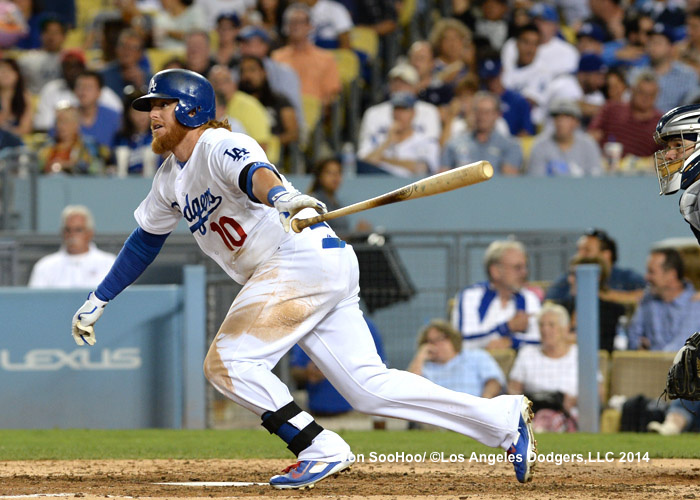 The big weight on the scale was Justin Turner, who delivered 3.2 WAR all by himself. Chone Figgins (0.6) was also useful in his abbreviated tenure. They more than made up for the departures of Elian Herrera, Nick Punto, Justin Sellers, Mark Ellis and Skip Schumacher. The biggest loss for the Dodgers in WAR was Ricky Nolasco (1.2), who had a 5.38 ERA and 4.30 FIP in the first year of his four-year deal with Minnesota. Edinson Volquez (0.7), who signed a one-year deal with Pittsburgh, was more of a bargain, though not as much as his 3.04 ERA might suggest. In the bullpen, Ronald Belisario, Javy Guerra and Shawn Tolleson combined for 0.8 WAR, which isn’t much but proved better than what Chris Perez (-0.8) delivered. Seth Rosin never pitched in a game for the Dodgers after being acquired on the day of the Rule 5 draft, but I included him here as someone they had and then let go. Among the 2013 Dodgers who didn’t play in the big leagues in 2014: Nick Buss, Jerry Hairston Jr., Peter Molyan and Michael Young.